The scanner is perfect. It was easy to set up and it is easy to use with the help of Smart Touch. KODAK SCANMATE i1150 Scanners process transactions at the speed of business. The transformation of information capture continues. Businesses must deal with more diverse sources of information than ever before. And yet paper remains an important input source. Companies are focused on generating efficiencies where the value of information capture from paper is greatest – in business transactions. The KODAK SCANMATE i1150 Scanner is designed for use in customer-facing business transactions, where an employee needs to scan documents as part of a business process. Employees using these solutions are typically interacting with customers and need to keep the transaction moving to reduce wait times and increase customer satisfaction. Recognizing that a majority of transactions involve 10 or fewer documents to be scanned, the KODAK SCANMATE i1150 Scanner features a special Transaction Mode, enabling 60 percent faster capture speed for the first 10 pages. Scan documents and capture information, extract data, and handle documents once. Benefit from an intuitive, icon-based color interface. Take advantage of associated cost savings. And that's just the beginning. 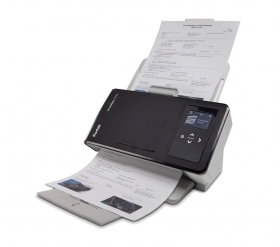 Small, quiet, quick, and intelligently designed, the SCANMATE i1150 Scanner accelerates your processes with seamless technology so you can focus on your customers. System administrators can manage and maintain select KODAK Scanners on their network through one easy-to-use solution. Optional KODAK Asset Management Software, featuring a thin client dashboard, optimizes time, budgets, resources, and efficiency. You'll know more about every scanner and be able to do more across your network. Only Kodak Alaris offers essential services to ensure the optimal operation of your scanning solution at time of installation and beyond. The three year worry-free warranty (US and Canada) puts Kodak Alaris knowledge to work for you helping your KODAK SCANMATE i1150 Scanner to satisfy your evolving business process needs for years to come.